"I recommed her absolutely, Reverend Barb is a gifted healer..."
"I am in a State of Greace...after your energy attunements, I could walk directly into the throne room of th Father/Mother Creator and know that I am worthy to do so, because I am One with All That Is." I went to physical therapist yesterday. He said the surgeon was shocked that I didn't have a rotator cuff tear as it showed up in the MRI!!! I didn't tell him I had amazing healing power work done on me!!! How amazing!!!! Thank you! Thank you for your wonderful healing light and love!" “I bless the day I found Reverend Barbara Ross. With lower back pain increasing over several months, I was unable to stand straight or sit for any length of time. Somehow the Universe brought Reverend Ross to me in my time of need. With a healing touch session that lasted approximately thirty minutes, Reverend Ross literally “ironed out” the stress, pain and cramped muscles throughout my back and legs. The session created an extraordinary feeling of peace and tranquility rolling down through my body and releasing all pain and suffering. With the release of the pain, I could again feel the love of so many of my spiritual angels who watch over me throughout my life. I continue to feel the effects of our session to this day. So, again, Thank You & Thank You for your patience and ability to work with me at the places where I have been and am in awareness. I feel this waiting period has about come to full circle in terms of all I have learned from the demolition of the old, to the reconstruction of a new, to the test of the strength of what was reconstructed as new through this past, recent relationship. I also see this as a life long process of 'death & rebirth' towards deepening levels of awakening to Spirit. This year has been long, but a remarkable time of spiritual healing and learning in such a way that I am not sure I would have been able to get the depth of these lessons if things had been any different... Nor, do I feel I would I have been ready to embark on the next phase of life, including the coming career path. In that regard, I feel I can see Divine Timing. I feel there is much Truth in the saying, 'that often times in losing everything, everything is gained' .. if willing to keep faith & keeping look for & at the gifts that come from the rubble. " "Reverend Barb has been a transformative figure in my life since my first reading with her a few years ago. Her intuitive counsel and connection to Spirit has provided insight and peace to my life throughout loss, emotional trauma, career changes, and my spiritual journey. Most importantly she has equipped me with practical tools based on light and love to assist me in my daily life, furthering my spiritual growth and discernment. 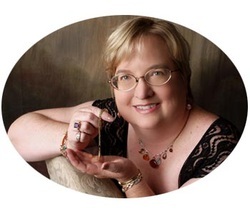 I recommend Reverend Barb to anyone who desires personal and spiritual growth and healing." "Thanks for taking time out of your busy schedule to speak with me regarding my career goals. I left our meeting feeling very confident and energetic about making a career move. Again, thank you." “I want to share with you the wonderful service you have provided me. I am a 57 year old widow who has not worked in my profession in over 5 years. When you spoke to me you gave me back my self esteem as well as self confidence. Because of the positive approach that you have shown me and the self confidence you have restored for me, my interview was a success. In fact, the company offered me $9,000 more a year than I had asked for." "My reading was the best Christmas present I have ever received! What an impact you have made to me. Thank you so much for your channeling!" "I keep feeling waves of gratitude to you for prompting me to pay attention. Thank you, thank you, thank you..."
“Reverend Barb has been helping me interpret my dreams for the past several years and has provided countless valuable insights during a period when I was undergoing significant spiritual growth. Barb helped me understand how these dreams were tied to this growth and to the events that were happening or were about to happen in my life. Barb has a real gift for dream analysis!" Contact Reverend Barb for your session today.